When Clara Rising's Civil War novel, IN THE SEASON OF THE WILD ROSE,received an award from the Sons of Confederate Veterans in Louisville, she met a descendant of Zachary Taylor who questioned the diagnosis of gastroenteritis. Thus began an investigation which led to the exhumatin of the 12th President of the United States in 1991. Her years of research and teaching (Ph.D. English/Philosophy, assistant professor of Humanities at the University of Florida)had prepared her for this formidable task. Aided by forensic scientists who agreed with her doubts, she interviewed the nearest living relative, Mr. John McIlhenny, owner of Tabasco, in Baton Rouge. 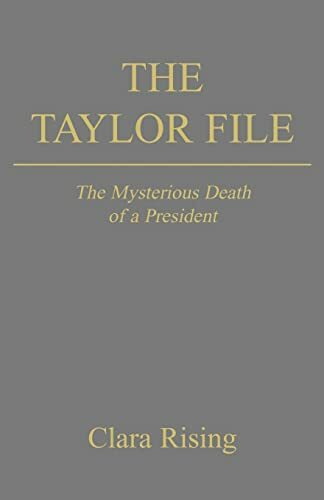 The result is a careful recreation of Taylor's life recorded with a novelist's sensitivity to motives and possibilities. The symptoms of Taylor's illness matched almost perfectly those of arsenic poisoning. Because his wife had refused to have him embalmed (until 1913 arsenic was used in embalming) and because he had never been buried in earth (first in the Congressional vault in Washington, next in a brick-lined crypt in Louisville and last in a marble mausoleum), his body would be free from contamination. The coffin was lead, hermetically sealed. When Rising presented this research to Dr. William Maples, the famous forensic pathologist, he called it "a textbook case." She never wanted more than a lock of hair. It was the custom in those days that relatives often kept a lock of hair. Weider and Hapgood, in their 1982 book THE MURDER OF NAPOLEON, proved, with NAA (neutron activation analysis, based on radioactive measurements from a nuclear reactor), that Napoleon had been murdered with arsenic. Rising found a lock of hair in the Smithsonian, but it had been compromised by pesticides in the 1930's. Then she found another, in the Cabildo museum in New Orleans. She was about to catch a plane when the curator called and said, "It was Andy Jackson's." She caught the plane anyway, rented a car and drove to Baton Rouge, where she interviewed Mr. John McIlhenny, the nearest living relative, then age 84, for four days. And the rest, as they say, "is history."